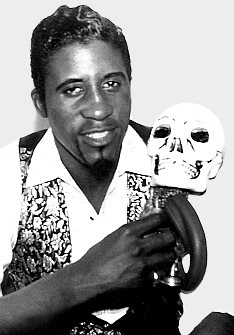 Superstition, voodoo and horror movie gimmicks were all part of the Screamin' Jay Hawkins mid-'50s formula. He was the wildest of the early rock and rollers bar none, employing grisly shock tactics in mediums visual...and audio. Jay had always wanted to be different, figuring that to make it big he would need to have an unusual image and sound. He never had a hit record, but his signature song, "I Put a Spell on You," gained notoriety over the years as it frequently cast its exquisite deformity over movies, TV commercials and even news reports. Singers and musicians who counted themselves among his fans released their own interpretations of Jay's thesis on preponderance; versions by Nina Simone, Alan Price Set, Creedence Clearwater Revival and The Crazy World of Arthur Brown all made the charts, while the original sold consistently and became the headline under his name at the numerous concerts and club dates that featured his growling, shouting, snorting...and even singing. The infant Jalacy J. Hawkins woke up one day in a Cleveland, Ohio orphanage (his mother, burdened by several children, had dropped him there) and I can imagine the tyke was fed up with his cramped cradle by the time his adoptive parents arrived around his 18th month. Within a few years he started teaching himself how to play piano. The kid idolized opera legend Enrico Caruso and the great actor-singer Paul Robeson and later claimed he got into the Army with forged papers and fought in World War II, though he would have been no more than 14 or 15. A Golden Gloves boxer during his teens, Jay pursued a less-physically-strenuous music career and in 1951 he landed a spot playing piano with Tiny Grimes' Scottish-kilt-wearing band The Rocking Highlanders. He delivered a mournful vocal on his first recording, "Why Did You Waste My Time?," with crying, weeping, and a quick, foreshadowing scream; the Grimes/Highlanders track, issued on the Gotham label in 1953, credited him as Screaming Jay Hawkins. He developed a tendency towards theatrics early in his career; exposing his knees in those plaid kilts may have gotten him used to the idea of sporting unusual outfits onstage. But Jay really just wanted to startle his audience...nice goal! As his solo career got under way, the songs got wilder. His macabre streak is evident on the 1954 Jalacy Hawkins single on Timely, "Baptize Me in Wine," as he babbles incessantly while singing about having the vino poured over his coffin-confined, still-breathing body ('If wine's gonna kill me, I don't mind dyin'!'). Another grape-potion ditty, "I Found My Way to Wine," followed. After signing with Mercury in early 1955, Jay led off with proof (in the pudding?) that he was going for ghastly, loud, superstition-themed content earlier than many are aware. He was using Jay Hawkins professionally at this time, but the "Screamin'" nickname (with or without a "g" like on the Gotham disc) could have been - should have been! - emblazoned on record labels. "(She Put The) Wammee (On Me)" was designed to shock: 'I bought a shotgun...a big long shotgun...I put the barrel upside her head...I said release me...or I'll blow the moonlight clear through your bald head...' (guttural screams) '...she put the WAMMEE on me!' (anguished shrieking...endure it if you can). Not the most poetic words ever lumped together, but the "Fright Factor" switch was definitely "on." Two singles for Mercury's Wing Records divison were a bit more conventional, after which Hawkins signed with Epic's Okeh label and the Halloweenish hijinks resumed. In the fall of '56, he commenced the nightmarish process of constructing his plastered masterpiece. Producer Arnold Maxin wasn't feeling the ballad approach Jay was intent on applying to "I Put a Spell on You" ('...because you're MINE!'). Legend recounts a drunken in-studio soirée that took place after Arnie sent out for a large order of chicken and barbecued ribs with plenty of whiskey, wine and beer for the whole band. Everyone got so smashed that Jay couldn't remember what had taken place. When he later heard the track, he supposedly didn't recognize his own voice...but with "Wammee" already deeply embedded in history's scrolls, that would seem unlikely; should we write it off to a few corroded brain cells? At age 27, it's better than being dead, I guess! 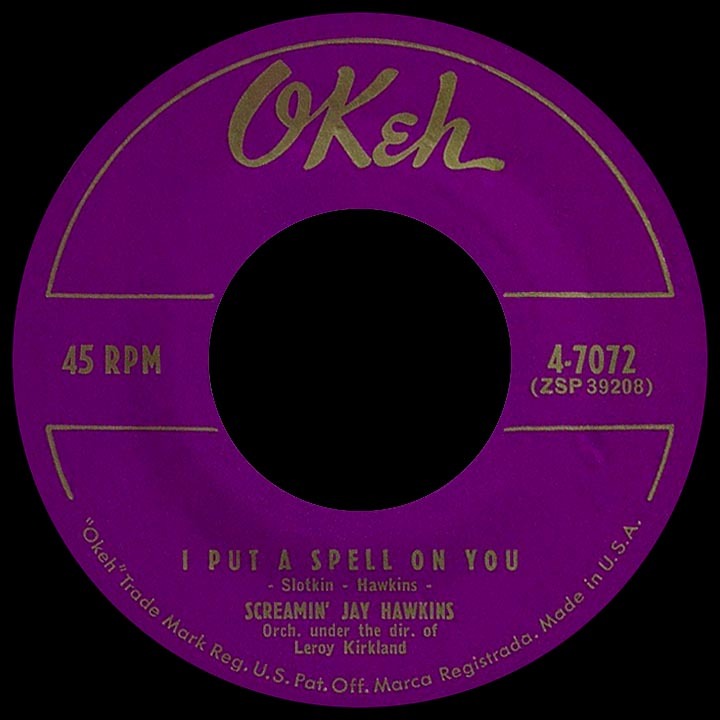 Sessions proceeded with Leroy Kirkland's orchestra; Irving Nahan's mumblin'-fun tune "Little Demon" got the Screamin' Jay "Spell" treatment and the repulsively appealing tracks were placed on the market as a single. Resistance at radio and a general fear of what many felt was a cannibalistic eavesdrop have been cited as reasons for the disc's failure. Or maybe, like "Wammee," it was just too far ahead of its time. The early verdict hadn't come in yet when WINS deejay Alan Freed booked Jay for his 1956 "Rock 'n' Roll Christmas Show" at the Brooklyn Paramount. Having a longtime anxiety about small, closed-in spaces, Jay rejected Freed's idea of his arriving onstage in a coffin...until several of Grant's greenbacks caressed his palms. The crowd went nuts (especially the female fans...look out!) and Jay's fate was sealed in that box for the next four decades. Performance enhancements included flashy, tacky outfits (turbans, leopard skin jackets, zebra-striped capes, Zulu warrior gear), bizarre props (shrunken heads, rubber snakes, fuzzy, flexible spiders and a cackling skull-on-a-stick named "Henry") and occasionally a fake bone in his nose! The NAACP was not entirely pleased; Jay didn't care as long as he could "go to the bank," as he put it. And did I mention the women? Our screamin' loverman cavalierly took advantage of all opportunites...years later he claimed to have fathered more than 50 children! Jay loved pop standards, but when it came to interpreting them in his own style, well...case in point: follow-up single "You Made Me Love You (I Didn't Want to Do It)" was played more for laughs, an impolite-inflection rendition of the classic James V. Monaco-Joe McCarthy song popularized by Al Jolson in 1913 and again by Judy Garland during her late-'30s heyday. Jay practiced making sound effects with his voice, mouth, lips...steam practically came out of his ears...and the wildness continued with David Hill and Bobby Stevenson's "Frenzy," its pace consistent with the song's title. Cole Porter's fabulous four-year-old musical number "I Love Paris" got the SJH treatment and it hasn't been the same since. Movie stardom cometh not...yet: Jay's appearance in Alan Freed's fourth rock and roll movie, Mister Rock and Roll, was left on the cutting room floor...for reasons already implied? And which song was it? 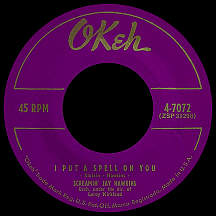 "Alligator Wine"...a nasty marsh creature concoction, a harrowingly swampy screamer, another delightful stomach-turner; the single marked the end of Jay's association with Okeh in '58, mere months after the release of his epic Epic album At Home with Screamin' Jay Hawkins. There were singles on many labels (Grand, Red Top, Enrica, Chancellor, Roulette), covering several revolting topics: "Armpit #6" (his baby's own kind of perfume), "I Hear Voices" (insanity a reality by '62?) and a weirdly overhauled "I Put a Spell on You" on Decca in 1967, an entirely different song that briefly used the hook from the original. Hawkins took a break from the music business and lived in the Hawaiian Islands for part of the 1960s. Towards the end of the decade he made several recordings for Philips Records, including the album ...What That Is! and its donation of a potful of tasty vermin in "Feast of the Mau Mau" and the infamous "Constipation Blues," an experience known to all but shunned in song...until Jay confronted the pain. Offensive? Yes! Top track of the next decade: 1973's "Africa Gone Funky" on London. He finally turned up on the big screen...briefly, in the '78 rock flick about Freed, American Hot Wax. Touring kicked into high gear and Screamin' Jay appeared in nightclubs near you...and you...and you! The Pine Street Theater in Southeast Portland was transformed into Screamin' Jay's own den of iniquity one weekday evening in 1987 and I was lucky enough to see for myself the kind of madcap musical meetings he'd been presiding over for more than 30 years. With his legend preceding him, Jay (and skullhead pal Henry) pulled out all the stops, emerging from a fancy but well-worn coffin decked out in his voodoo jungle garb; with dry ice smoke all around the stage, he launched right into "I Put a Spell on You," working clubgoers into a fever with one unnatural Hawkins standard after another, finally closing well over an hour later with a reprise of "Spell"...after a break, the show started over, with most of the first crowd hanging around for the worth-seeing-again repeat. Witnessing four performances of his most famous song in one night was unexpected. Oddly, I can still transport myself back there in clear detail. I suppose it was just too enchantingly abominable to fade from memory. Soon afterwards he became a cult movie star, starting with a small part in 1988's Two Moon Junction. Then his marvelous deadpan performance as the night clerk at a seedy Memphis hotel in Jim Jarmusch's twisted '89 indie flick-slash-rock and roll tribute movie Mystery Train landed him an Independent Spirit Award nomination for Best Supporting Male (he went head-to-head with co-star Steve Buscemi, whose deliriously spectacular acting career was starting to kick in...they both lost!...but of course!). A couple of other oddball parts in the films Dance With the Devil and Peut-être darted in and out of theaters in the '90s. Screamin' Jay Hawkins died in 2000 (but requested he not be buried in an all-too-familiar coffin...cremation was fine!). I have a feeling he's actually still alive...in a swamp somewhere, maybe. A fittingly peculiar encore occurred the following February when five of his illegitimate children, all grown up, staged a tribute show for their dad at the House of Blues in Los Angeles. Can't imagine another event quite like it has happened before or since.